Walking with Aalasi This study consists of a series of activities focused on the book Walking with Aalasi: An Introduc­tion to Edible and Medical Plants by Anna Ziegler, Aalasi Joamie, and Rebecca Hainnu. It has been created to partner the Uqalimaarummaq Reader, A Walk on the Tundra by Rebecca Hainnu and Anna Ziegler. 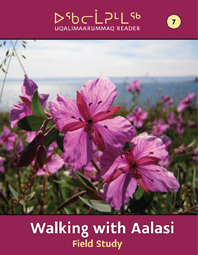 Walking with Aalasi is a non-fiction introductory guide to traditional Inuit plant use. 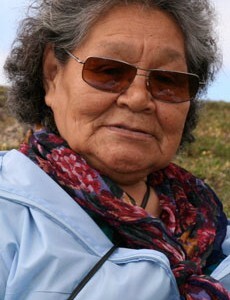 Through­out the book, Aalasi shares her knowledge and memories of eighteen plants commonly found across Nunavut. The authors, Aalasi, Rebecca, and Anna, used the story of Aalasi’s life as inspira­tion to write the fictional story A Walk on the Tundra. Throughout this book study, learners will participate in a variety of reading, writing, oral com­munication, and field study activities that will expand their knowledge of the topics of study presented in the book study that accompanied A Walk on the Tundra: Plants, The Environment, and The Community. Learners will also participate in a variety of comprehension activities, comparing the text fea­tures, setting, and characters in each book. Learners will emerge from this unit with a better understanding of plants and their many uses and the ability to share what they have learned with the next generation.